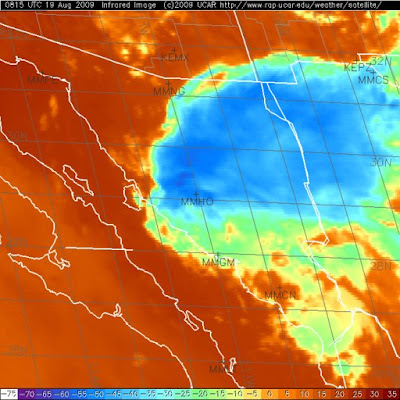 Just a review of my rule-of-thumb regarding Tropical Storms and Gulf of California surges. If a storm passes through the shaded box shown above moving with a westward component, then the winds and pressure rises east and southeast of the center trigger a surge. The surge usually occurs within about 24 hours after the storm moves north of 20N. However, if a storm is moving to the north or north-northeast the situation becomes more complicated. In this case (or if the storm actually enters the GoC) the pressure gradient can point down the GoC and the only pressure rises are behind the storm. Forecasting the weather and storms ahead of the TS becomes complicated by many factors, including MCS developments as hot, unstable air flows into the circulation from mainland Mexico; the track and speed of the TS as it decays; the strength of easterly winds north of the system; etc. It appears that Jimena is going to be one of these tough ones to outguess. Art Douglas notes that a large MCS may develop tonight along the first rainband over the southern GoC and act to push the subtropical air rapidly up the Gulf. So we'll have to wait and watch what this powerful Hurricane does. Hurricane Jimena (IR image at 14Z above) will move north of 20N tonight and low-level moisture will push strongly into the lower Colorado River Basin. 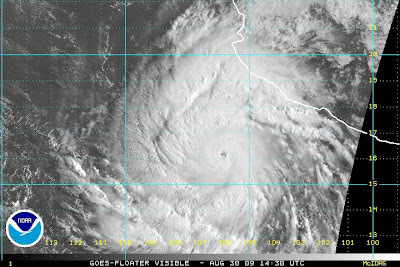 Note that Jimena has a very large cloud shield associated with it. Moisture continues a slow increase over southern AZ with quite a bit of cloud cover and a few showers over the southwest part of the state and drier conditions to the southeast. Impacts from Hurricanes moving along Jimena's predicted path usually occur sooner than expected here. Later, when the decaying storm moves north, the details are determined by the final path of the disturbance. There was a slight uptick in storms yesterday - thunder and outflows around town with some rain on the Catalinas. Five of 93 ALERT stations had measurable rain but amounts were light. The really strong push of GoC moisture has yet to materialize, but the morning soundings at Tucson and Phoenix have very steep lapse rates and with the current amount of moisture present it appears that there will be CAPE in the lower elevations this afternoon. The NAM forecasts increasing easterly steering winds during the evening as the first disturbance over the GoC squeezes north - thus, there will be a good chance for storms with downbursts during the late afternoon and evening, and some of these may produce severe winds and dust. Tomorrow, and beyond, depends upon a myriad of complex mesoscale details that will be determined by storms today, cloud cover, strength of easterly winds, exact track of Jimena, and etc. 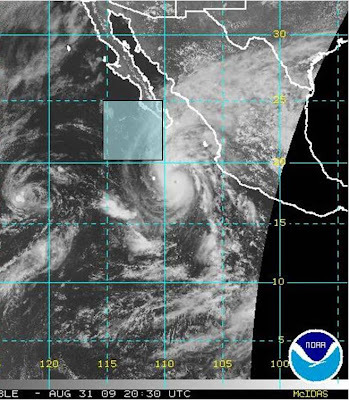 Hurricanes Nora in September 1997 and Javier in September 2004 provide nice examples of how the final impact of tropical storms can differ widely here in southeast Arizona. The probabilities of precipitation will increase markedly tomorrow and Tuesday as moisture increases and several short-waves approach from the south. An excellent shear profile for severe thunderstorms tomorrow if the CAPE increases. The lastest discussion from NHC updates Jimena to a Category 4 storm with gusts as high as 135 mph. The story in this morning's Star has jumped the gun a bit with Cat.3 (forecast to be a 4) Huricane Jimena. The storm this morning is well south of Cabo Correntes and is forecast by NHC to approach Baja tomorrow night. The NHC cautions however that there is a wide spread in the model guidance for this storm, with the GFDL being east of the forecast track shown above and the ECMWF being well off to the west. So, a careful watch is needed. This morning: the 500 mb high is shifting eastward; middle-level moisture and PWs are increasing slowly; we may have a sliver of CAPE at low-levels but the bad RRS data make it hard to know; there should be increasing CAPE over higher elevations and to the south; and middle-level temperatures remain quite cool. Thus, look for an upturn in activity starting today and continuing through the week. The disturbance in the GoC is quite pronounced this morning and it should pull northward as Jimena moves to the northwest. Still expecting a serious influx of low-level moisture by tomorrow morning. This occurs as pressures fall on this side of border (most low-elevation stations down almost 2 to 3 mb during last 24-hours) and the GoC disturbance shifts northward. First week of September will be very interesting - a nice change. The morning Tucson sounding is shown above - it had about 0.4" of precipitable water but the GPS PW indicated that it actually had about 0.6". No lifted parcel in the sounding had the character described above. So, I assume that something went awry - perhaps an examination of a different sounding? I think I'd argue that it's not YOU who is confused! You're being very generous, as usual. One wonders how this sort of erroneous diagnosis could have been done, of course. Unfortunately, the diverse tools (some of which are amazingly poor at what they purport to do) at a forecaster's disposal in today's offices makes it difficult to track down. Will Jimena Come Our Way? Yesterday was again very hot and dry. The cool middle-level temperatures combined with the 100F plus temperatures to produce some isolated, very high-base Cbs and at most a sprinkle or two. This morning precipitable water remains very limited with amounts from 0.60" to around 1.00" with a slow creep upward at several locations. A brief push of GoC air inland has produced higher dewpoints at Yuma. A push of easterly winds associated with a backdoor front from New Mexico has pushed past Tucson and Phoenix into south central Arizona but dewpoints are low either side of this feature. With the cool temperatures aloft, isolated high-base Cbs will likely be the high point of today's weather. It still appears that a serious return push of the subtropical moisture will begin tomorrow and increase on Monday (note that the dry air has pushed far south with Hermosilla only showing an inch of PW this morning). The northward push will result from both the eastward shift of the 500 mb high, and the movement northwestward of the current disturbance over the south end of the GoC. Yesterday I noted to some that the depression, or TS, spinning off the southwest coast of Mexico was far better organized than Danny was - of course all the attention was to the east on Danny boy. This feature was identified as a depression at 0300Z today by NHC and is currently a hurricane by name of Jimena (see IR image above). 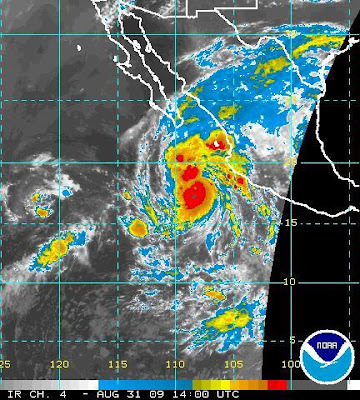 Jimena is forecast to be a major hurricane and to move toward the southwest of lower Baja. Thus, September may get off to an interesting start with two features from the south affecting Arizona during the coming week. The 02Z IR image above shows that MCSs in Mexico yesterday evening developed far south of the border. There were some storms later in southwestern New Mexico, where there is a bit more precipitable water. Conditions were very suppressed in Arizona yesterday with record level heat. This morning (28 August 2009) the 500 mb anticyclone is centered over Laughlin NV with very warm temperatures west and north of the center. Cooler, but very dry air continues advecting around the east and south quadrants of the high. It appears that this anticyclone is now acting as a lobe of the Pacific subtropical high, thus the very dry fetch. The high is forecast to sink a bit south and elongate west-to-east during the next 36 hours, keeping Arizona mostly under upper-level subsidence - more dry heat. There is a distinct disturbance at the southern end of the Gulf of California, but in the short-term this feature moves off to the west and is replaced by what will perhaps be a stronger invert trough. There is also an upper-level trough moving southwestward across southern New Mexico and this feature will have little impact, except perhaps to enhance MCS development in Mexico tonight. In the longer-term, the next couple of inverted troughs are forecast to move more to the north and west and, inconcert with troughing in the Pacific and much lower pressures in the Great Basin, will likely bring a surge of low-level GoC moisture back into Arizona by Sunday am. The deeper subtropical moisture may also shift north Sunday afternoon and Monday as the 500 mb anticyclone is pushed to the east. There may be a Tropical Storm thrown into the mix by Sunday. So, there's still hope that we will see some more storms as August closes out. Comment on the Dry Heat! Another monsoon day wasted in Phoenix. The 12Z/27 sounding [above] at Phoenix was about the ugliest thing I have seen and really says it all. Despite seeing some activity on the 21st, rainfall amounts were isolated and only a Trace was recorded at Sky Harbor. The weather pattern doesn't hold much hope for us folks up here through at least the weekend. Another thing I wanted to mention was the incredible weather Phoenix saw at this time last year. One of the biggest thunderstorm outbreaks I can recall hammered the Phx metro on the night of the 28th. It was an interesting setup because not much activity was happening during peak hours, despite an atmosphere that was primed for severe weather. Things finally got going in a big way shortly after dark. The link below is from the Phoenix NWS and describes the event thoroughly. I was in charge of the morning sounding from August 22, 2009. During the run the RRS antenna locked-up which happens a few times each year. In order to get the antenna to track again it needs to be reset. It is my understanding that during the reset process no data is collected. I know for a fact that data was missing between 665 mb and 615 mb in the raw RRS data. I don't know how this might impact the RAP plotting routine. On AWIPS the sounding plot looked much less "hygristorally challenged" than usual. Hope this helps. This morning's strange stair-step sounding from Tucson is above - too dry realtive to GPS, but it illustrates the current dismal convective situation well. Precipitable water over southern Arizona is right around 3/4" with depoints 30s to low 50s. No rainfall yesterday in ALERT network. The northern boundary of the moist, subtropical air has again been pushed down to around Guaymas. There was strong MCS activity last night in Mexico east of the southern reaches of the Gulf of California. This kind of activity will probably occur further north each of the next couple of nights. The 500 mb anticyclone is centered over southwestern Utah this morning. There is warm, dry air in the southern and western quadrants of the high and cool, dry air in the northern and eastern quadrants of the high. Some cool advection over southeastern Arizona is likely, and the cool middle-level air, combined with a a hot boundary layer will produced isolated mountain storms today, increasing tomorrow, especially as more moist low-level air works westward in New Mexico. So it looks like several days of increased moisture recycling by mountain and, hopefully, northern Sonora storms. Mostly dry downburst conditions prevailing tomorrow. Saturday - too early to tell what the desert boundary layer might look like. By Sunday afternoon and Monday, both the NAM and ECMWF forecast a disturbance or two moving northward from the subtropics and a likely return of moist low-levels to at least the southern portions of Arizona. Meanwhile, convective weather here at house could happen tomorrow, but mainly with wind and dust yet again. Storms mostly on mountains yesterday (Tuesday August 25, 2009) but with a few drifting toward the south out over lower elevations. Thundered here at the house around 4:30 pm and again around 7:00 pm, but we only had some spits of rain. The storm shown above was west of the house at sunset and it was very active with frequent incloud lightning, but I didn't see any CGs. 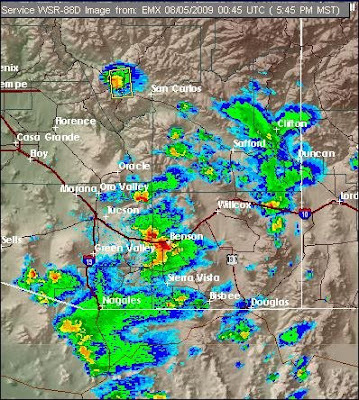 DM weather forecaster H. Green reported a storm with heavy rain and 1/2" hail at 5:30 pm - he was out at west Ajo Way and Kinney Road. The strongest storm (as indicated by radar) in eastern Pima County was moving south off the Tucson Mountains at that time. Only 10 of the 93 ALERT gauges measured rainfall yesterday. Dewpoints continue on a downward trend, with 60s hanging on only in southwest Arizona at Yuma and Gila Bend. Precipitable water has fallen to values around three quarters to an inch. The 500 mb anticyclone has shifted south with its center over the central Gulf of California this morning. It will shift north over Southern California and then over southern Nevada during next 36 hours. The steering flow will become very favorable for moving storms toward the low deserts; however, the subtropical low-level air has been pushed down into Mexico again. So we'll be in a down mode with only some mountain storms to east and south until some feature acts on the GoC to push the moist air back north. Right now the only things in sight would be falling pressures over the lower Colorado Basin and MCSs moving out over GoC. In the longer term the ECMWF keeps the subtropical air to the south through the weekend before bringing some subtropical disturbances north toward the Southwest. So, a not very exciting end to August as things appear now. perhaps due to missing data? Even the Wyoming radiosonde data web site has data for that layer. What isnt clear is if there is some quality control occurring at the RAP website. I should have mentioned the wind void on the RAP sounding plot - this gap was not a problem with the RRS data, as winds were observed through this layer. There is some kind of software problem in the RAP plotting routine that sometimes causes winds not to be plotted through a layer - reason unknown, but I've seen many examples of this problem during last several years. Good example of why, if something looks strange in a sounding, one should cross-check with the plots/data at other sounding access sites, e.g., SPC, Wyoming, FSL, etc. 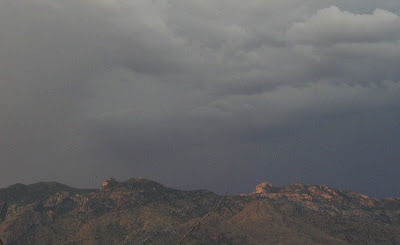 View of late afternoon storms developing over the Catalina Mountains yesterday (Monday August 24). The rest of the western short-wave trough (which is most distinct up at 300 mb) will pull northeastward across northern Arizona today. The big unknown is whether upper-level subsidence will be strong enough to damp storm activity today. Otherwise there appears to have been little change since yesterday. Very moist, low-level air continues to flow intermittently northward from the Gulf of California; dewpoints and precipitable water have been holding steady out to California; the Phoenix and Tucson soundings continue to have CAPE. So, it appears that today will be much like yesterday with the mountains triggering storms that will try to move northeastward, but steering winds are weakening with time as the anticyclone rapidly rebuilds toward the Great Basin through next 36 hours, so storms may just drift. The Phoenix morning sounding is quite unstable, indicating that there is some potential for storms to develop at lower elevations today. Storm activity the rest of the week probably depends to large degree on how much low-level drying occurs as the middle level anticyclone builds back northwestward. Tropical Storm Ignacio is forecast to move to the northwest but too far to the west to have very much influence on Arizona. There was more convection over Arizona than I had expected yesterday, particularly over mountains to the west of Tucson. Storms occurred all the way out to the Colorado River. Radar loops indicated that the storms were strongly locked to mountain peaks and did not generally move far off the mountains. Here at the house we could see storms in all directions and several cells tried to develop nearby but didn't make it, except up over the Catalina Mountains. We did have a nice cool outflow again in the late afternoon, this time from the south. During the past 24-hours 25 stations in the ALERT network had rainfall, down only slightly from the 39 stations with rain on Sunday. Heaviest amounts were were in the Catalinas with 0.87" at Samiego Peak. The biggest problem with my outlook yesterday was that I expected dry and warm, middle-level advection to reduce CAPE during the day, with the gradual downturn in precipitable water continuing. However, there was actually cool advection across southern Arizona during the day in middle-levels and PW recovered or held steady at around 1.25 inches. So, there was nice CAPE, especially over the mountains, and lots of mountain storms. Note that the Tucson RRS sounding was very dry last evening wrt GPS PW, it's not possible to know exactly how much CAPE was present, except by the storm activity. The NAM initialization at 500 mb last evening (00Z on the 25th) shows a distinctly unfavorable flow pattern over the state with westerly winds and the strongest vorticity lobe well off to the east. But flow below 500 mb was light, allowing the mountains to percolate all afternoon. Yesterday illustrates well a point that I often try to make - given low-level moisture and CAPE, it doesn't really matter if the middle-level winds are not from a "classic monsoonal direction." We see this all the time, and it's why drying, middle-level winds from the northeast are sometimes present on big storm days. In a just world, these sondes would be replaced, and then a third party team of researchers (slave-labor grad students) could be tasked to "red-flag" all the likely-bad soundings in the RAOB archive. Then the gov't should take Lockheed-Martin to court to refund the cost of the bad sondes, assuming the sondes were "base-lined" properly before release. Yesterday was marked by storms that primarily stayed on or near the mountains. Only 39 of the 93 ALERT stations had measurable rainfall and these were the higher elevation stations. The mountain storms produced locally heavy rains - 11 ALERT stations had a half inch or more. Three stations in the Redington Pass area had more than an inch - that storm was visible from the house and produced a cool easterly outflow of about 30 mph here - otherwise a day with only anvils overhead. The Rucker RAWS station in the Chirachuas reported 1.98" for the highest amount I found this morning. The piece of the 500 mb short-wave that came ashore last evening was stronger than expected and it is moving across Arizona today. Vertical wind profiles have become southwesterly and the dry air aloft is deepening. Precipitable water profiles continue a slow downward trend. The Tucson sounding this morning indicates a bit of CAPE for low elevations, but more drying or slight warming in middle levels would wipe that out. The NAM has been too wet for this event, and I suspect that will again be the case today. Storms will again be mostly on mountains in eastern parts of state. Steering flow remains bad for low elevation regions - storms occur at the house under this kind of flow only if they develop nearly overhead. The week begins with drying, and then there will be several features rotating around the 500 mb anticyclone as it shifts westward. Looks like the NAM predicted TS will track too far west to trigger a surge. It also appears that the S/W coming ashore today may try to track all the way around the anticyclone and come back our way from the east later in the week. Running a bit behind, but I meant to mention the above sounding earlier. It is the morning sounding taken at Flagstaff on Friday August 22, 2009. It appears to exhibit a problem sometimes found in RRS data when the humistor is bad. Sometimes a bad RRS humistor will have a very very slow response time and tend toward very slowly changing RH. This leads to strange looking soundings that exhibit little structure in the Td trace (i.e., deep layers with straight line traces and similar zigs and zags in both the T and Td traces. The sounding above displays these characteristics, except for a noisy layer between 500 and 400 mb. I suspect that the humidty sensor used on this flight was bad. Soundings such as this will be very hard for all but the most astute researchers to detect in future years! Activity was considerably down yesterday, compared to Friday, with most storms occurring at higher elevations and on the flanks of the mountains. The sunshine we got wasn’t enough to heat up a well mixed boundary layer and it was quite a cool day. Additionally, the S/W that had passed by on Friday night was much stronger than the model runs suggested. Measurable rain fell at 44 of the 93 Pima County Alert Gauges, with quite a bit of that occurring before noon. Only 3 sites had half an inch or more and Corona measured 1.46” in a heavy storm between 11 am and noon. This morning there is dry air aloft above 500 mb; the lower troposphere continues moist with moderate amounts of CAPE; the deep moist plume is completely to the east of Arizona with clear skies prevailing; winds this morning are south-southwesterly to southwesterly not a very good shear profile for storms moving into the low deserts. Precipitable water has trended slowly downward with values over souther Arizona of 1.25 to 1.50" this morning. The 500 mb anticyclone is centered over the Oklahoma panhandle and is very large with a north to south orientation. A complicated situation once again. The NAM forecasts the deep moisture plume to shift back westward, with deeper moisture moving up from the south. The 500 mb trough off southern California does not come ashore until tomorrow. The SPC has outlooked a slight chance for severe thunderstorms today over the lower Colorado River Basin – see above – where temperatures are cooler at middle-levels and winds are stronger. The NAM continues to forecast significant precipitation and storms across eastern Arizona both today and tomorrow as strong southerly winds, with embedded ripples, prevail. The model also forecasts a strong vorticity maximum to move northward up the Gulf of California (there is a very large MCS just south of the mouth of the Gulf this morning). There should be an upswing in activity today, but the details remain fuzzy given the wind aloft profiles forecast; heavily raining storms likely perhaps a downburst or two. Tomorrow depends very much on what today brings. Storms moved rapidly into the Tucson area yesterday afternoon between 2:30 and 3:00 pm. I shot the above photo at 2:45 pm looking toward the east. There were several reports of severe winds in south central Arizona and a majority of reporting stations had gusts of 40 to 50 mph. Rain coverage in the Tucso metro area past 24-hours was essentially a 100%. There were 8 stations that had 0.50" or more, and 1 station with more than an inch (DEQ at Ruthraff 1.14"). So, a nice storm event that produced winds of 40 to 50 mph and 0.39" here at house - my 50% chance yesterday was way too conservative. The subtropical moisture/recycled moisture now covers most of Arizona with precipitable water amounts of around 1.6 to 2.0 inches indicated at lower elevation stations. It appears that the main vorticity lobe mentioned yesterday has moved past Tucson, so that storms today will be driven primarily by orography and local heating. The Tucson sounding has bad data in middle levels, but the data below 650 mb indicate that a little lift or heating will produce parcels with around 1000 m2/s2 of CAPE. Indeed, showers are continuing in many areas this morning. Winds continue strong through most of troposphere, with some veering from the SSE to the SSW from lower to upper levels, so storms will be fast movers. Water vapor imagery indicates that drier air will be trying to spread northward at high levels but this should not impact the CAPE in the lower troposphere today. Stronger storms today carry a threat of very heavy rain rates and wet downbursts. The NAM model keeps the moist plume over eastern Arizona through Monday, even though a large portion of the Pacific cutoff/trough comes ashore across the Great Basin. The NAM also indicates a Tropical Storm developing and moving to the southwest of the end of Baja, so that will be something else to watch. James Walter at SRP sent the above graphic showing past 30 day precipitation at stations in the Salt and Verde River watersheds. Lowest precipitation for this period on record in the watersheds. Another day yesterday with no rain across the Pima County ALERT network. There were some brief, strong, high-based storms to the east of Tucson late yesterday afternoon, but again the strongest storms were along and south of the border. Dewpoints are up at some sites and down others, indicating the low-level moisture we have is sloshing around on local circulations. Precipitable water values across southern Arizona are around 1.25” with the subtropical air still to the south, except for the Lower Colorado Basin where the northward push of high dewpoint air continues. The Phoenix and Tucson soundings this morning show some CAPE but still indicate a layer of dry northerly flow around 600 to 800 mb. Cloud bases would be high and lots of kick needed to get things going at low elevations. Heavy cloud covers much of southern Arizona but here in the southeast it appears that there’ll be some decent heating today – see 15Z visible image above. The NAM forecasts are verifying decently and the potential exists for a couple of days with storms and rainfall. The potential would be much better if the lower levels were moist and more unstable. The NAM forecasts a strong vorticity lobe and inverted trough in the lower half of troposphere to move across southeastern Arizona this evening, while upper winds are very diffluent. The vertical wind profile is forecast to be excellent for strong, organized storms (southeast at 700 mb; easterly at 500 mb; and southwesterly at 200 mb with speeds of 25 to around 50 kts). What more could you want? Higher CAPE! Regardless, it appears there will be adequate instability for mountain storms to organize and propagate into the deserts. There is a threat of severe downbursts and outflow winds today – especially if we can keep the sunshine into mid-afternoon. My forecast for the backyard – 50% chance of storms and at least some rain. Tomorrow – things tomorrow will be heavily dependent upon how the situation evolves during the next 18 hours or so. The models do indicate the vertical wind profile becomes southerly and uni-directional, which is a bad profile for here since storms tend to anvil out overhead. Models predict greater chances for rain over the weekend, but we’ll have to wait and watch. Very suppressed day yet again yesterday with only storm activity to the east and along the border. No rainfall measured in eastern Pima County network. The complicated situation discussed yesterday continues today with a few additional wrinkles. The vorticity maximum over central Gulf of California was actually suppressed to the south and is now over the southern Gulf (see 15Z water vapor image above) with a secondary lobe extending northeastward through the Big Bend country of Texas. The large 500 mb anticyclone is over northern Nevada this morning and as shifts southeastward today it appears that there'll be some dry advection from the north around 700 mb. This will serve to minimize CAPE again and keep activity pushed to the south. A back door front from the Plains will likely stall out around the New Mexico/Arizona border and not be a player over southeastern Arizona. The upper-level deformation zone is now over the border lands. It is forecast to shift north and weaken dramatically, leading to very strongly difluent flow aloft over most of Arizona by tomorrow evening. The NAM continues to forecast the inverted trough over the southern Gulf to move to the north-northwest, bringing the subtropical air mass northward into the Southwest by Saturday. The 500 mb wind speeds forecast by the model seem excessively strong, but as the vort max, the cutoff low west of San Diego, and the building anticyclone make a squeeze play, gradients will increase substantially. If the model is slow, as often the case, then there's good potential for a big storm day tomorrow and if not tomorrow, then an interesting weekend is likely in store. Yesterday - several small, high-based Cbs developed southwest of Tucson late - probably in response to the very hot temperatures at surface and the realatively cool middle-level air. These were quite nice visually at sunset but I didn't get a photo. No stations in the Pima County ALERT network measured rainfall in past 24-hours. A very complicated situation has developed overnight. 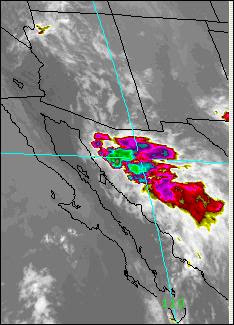 First, strong storms occurred much further north over Mexico (see 06Z IR image above) pushing some outflows into the borderlands. Additionally, at low-levels a nice anticyclone set up over northwestern Sonora and there has been a very pronounced surge of moist air flowing around this high. The net result is that stations in south-central and southwest Arizona are all reporting dewpoints 10 to 20F greater than at this time yesterday and Yuma is actually up 34F. At 500 mb there is 1) an inverted trough extending from south end of Gulf of California northward to Arizona - New Mexico border; 2) there is a very distinct circulation and vorticity maximum in this feature along 110W just south of 30N; 3) a shortwave that has been moving slowly southward from the northwest U.S. extends from north of San Diego to the nebraska Panhandle; 4) a cutoff low is at the end of trough 3 over the Pacific west of San Diego; 5) a large anticyclone is located over Oregon to the north of trough 3 with very warm and dry air in its core; and 6) a second anticyclone is centered near the northern coast of Baja. Throw in a very strong deformation zone in the upper-troposphere and it's clear that summertime synoptics are not aways dull over the Southwest. The way that all these features interact during the next 48 hours will determine the degree of storm activity across the southern quarter of Arizona. It appears that the northern anticyclone will dominate and push southeastward. This forces the Mexican trough/vorticity maximum off to the northwest toward San Diego. If southern Arizona stays in the flow around the vort max, activity will increase this late afternoon through tomorrow. But if the fetch around the northern anticyclone dominates, then thunderstorm activity will be pushed down to the border and south. The NAM forecasts are right on the fence this morning. Looks like some isolated storms this afternoon, even though we're in a typically unfavorable west to northwest flow regime. The NAM for tomorrow evening indicates that all of Arizona is in the dry circulation around the northern anticyclone. But, it appears that tomorrow will have a distinct binary character to it depending on which flow regime dominates - either a day with significant strong storms or another mostly suppressed day. Very hard call - just have to watch to see how things evolve. The NAM indicates the the strong southerly flow that develops between the cutoff and the dominant anticyclone interacts to pull the moist, subtropical air north again Friday and Saturday with the strongest push into the lower Colorado Basin and southern California - looks like a chance for severe storms in the Mojave on Friday and Saturday. 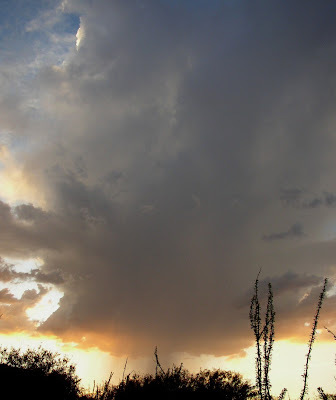 Chuck Doswell asked: Any idea of the history of "failed" AZ monsoon rainy seasons? Is this something of historic proportions or is it something that happens every so often? Paul I. of Phoenix replied: At least from the Phoenix database, my single point analysis shows there have been other years worse than this one. Can't provide a "why", or how often, but it appears that this does happen every once in a while. Normal for this period is 3.88". I snipped the above graphic for southeastern Arizona from the Tucson NWS web page. It shows summer 2009 rainfall from June 15 to August 17 versus a 30-year normal for the same period. 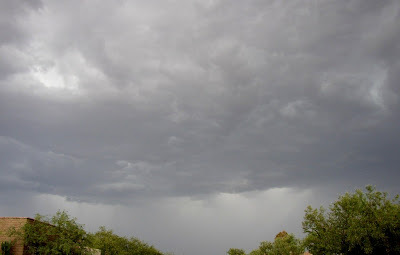 So, several locations are having what I've been calling a failed monsoon with small percentages of typical rainfall at this date (Organ Pipe NM 16%; Safford 22%; Tucson 53%; Douglas 53%). Even though I've been moaning about things here at the house, it's been much worse at Organ Pipe and Safford. In contrast, Willcox, Picacho Peak, and Ft. Thomas have been having a fairly typical summer so far. This illustrates the patchwork character of summer rainfall down here - not surprising for a region of complex terrain during a mostly convective regime. These data are for a subjectively determined monsoon period and are thus not directly comparable with the data in the table. 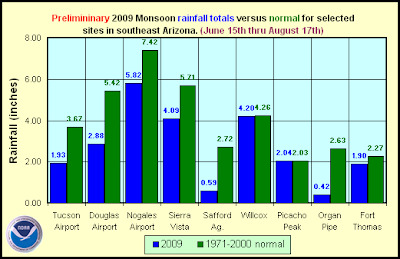 But, it does appear that Safford and Organ Pipe NM have some chance of experiencing their driest ever summer/monsoon period during the period of records. The convective character of the summer here is again illustrated by the fact the 8 years of record rainfall amounts have only one repeat year. There were a few thunderstorms along the far southeast borderlands yesterday afternoon. This is where there is a weak trough at 500 mb separating the anticyclone off Baja from a weakening center over west Texas. Again, the morning NAM does not have these two centers initialized well. Deep westerlies prevail over most of Arizona and a weakening polar jet extends from northern Arizona eastward across Omaha into the Great Lakes Region. Upper-air soundings this morning are very dry and stable wrt moist processes. Surface pressures are falling (down about 1 to 1.5 mb in past 24 hours) across southern Arizona and dewpoints are also down some, except at Douglas where their morning dewpoint is up 6F relative to yesterday. The NAM indicates that the western S/W trough (currently from central California notheastward toward Hudson's Bay) digs markedly next 60 hours (keeping Bill out in the Atlantic) and extends the westerlies across New Mexico. The models don't do much on returning subtropical moisture (see GOES 12Z precipitable water above) into the West until after 84 to 96 hours. 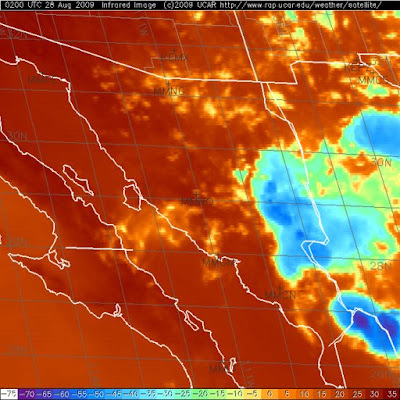 The moist subtropical air mass extends southward from Guaymas across western Mexico. However, with weak cutoff at 500 mb approaching southern California coast and falling pressures in lower Colorado Basin, shallow surges of low-level moisture are likely next couple of days. After 96 hours, the ECMWF is much more aggressive in bringing deep moisture northward around the west side of the subtriopical high than is the GFS. So, it looks mostly hot and dry until the weekend, with storm activity most likely along the eastern Arizona/Mexico borderlands. Delayed by yard work this morning. Skies over Arizona are as clear as they can be and it continues clear, dry and hot in the afternoons. The 1615Z visible image shows only a smoke plume from a fire about 13 miles southwest of Flagstaff - the Taylor fire. The TWC sounding is unbelievably dry this morning at 850 mb with a 50+C T-Td spread and just 0.27" of precipitable water. Phoenix in contrast has a more realistic spread of 29C and precipitable water of 0.52". Of course these kind of values remain terribly low for August and the subtropical air mass has been pushed south past Guaymas this morning. The 500 mb anticyclone has two nearby centers of circulation this morning - one over the Pacific just west of central Baja and the other over southeastern New Mexico. The morning NAM does not seem to have either of these centers initialized very well. The NAM forecasts are more dry than were yesterday's runs and tend to keep us under the influence of the Pacific anticyclonic circulation until late in the week. So goes the failed monsoon of 2009. It's a very nice and dry morning here in Tucson; 6am temperature at house is a pleasant 66F. Appears that the western tail of the 500 mb trough moving along the U.S. - Canadian border will dig south along the west coast and be sheared off from the main trough. This leaves a cutoff in the baroclinic westerlies influencing the Southwest for most of this coming week (see the GFS 120 hour forecast above). This feature interacts with the rebuilding ridge and several inverted troughs that the model forecasts will be moving around the western periphery of the anticyclone. So it appears that moisture and storms will move back northward, under the influence of both westerly and subtropical features, sometime during the next several days. The digging 500 mb trough over the Great Lakes will both affect the Tropical Storms in the Atlantic and also push the subtropical high back to the west. It should be a week with lots of interesting changes. We basically continue with our failed monsoon of 2009. The large-scale pattern is again very Fall-like. The polar jet with the current western trough extends south almost to the northern Arizona border - certainly not good for kicking up our summer rain amounts. No precipitation in the Pima County ALERT network yesterday. So it goes this summer. The models are a mixed bag for the coming week. The ECMWF tries to bring a weak 500 mb cutoff in from the northwest and then let it interact with the subtropical flow. The NAM in the shorter term forecasts several inverted troughs across Mexico but keeps the moisture mostly in Mexico. The most interesting weather during the coming week or so will be the new flurry of activity in the Atlantic tropics. Ana is forecast to move quikly toward the U.S., but to remain a Tropical Storm. Tropical Depression Three is forecast to become a hurricane and this is the wave that the long term models have been bringing into Gulf of Mexico as a hurricane. The subtropical low from Mexico moved quickly by Tucson yesterday morning, leaving us in the dry quadrant during the afternoon. Total rainfall at the house was only 0.17” and amounts were generally light except to the south and east where Art Douglas reported over two inches in Ash Canyon (southeastern flanks of the Huachuca Mountains). 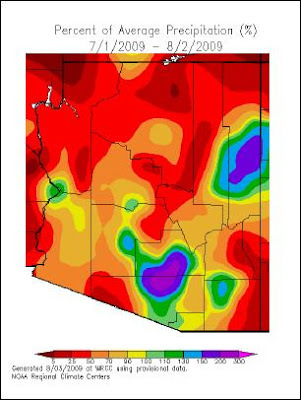 The Pima County ALERT network had rain at 37 of 93 gauges in the past 24 hours – most of the reports were over the south and east parts of the network and likely occurred before 1 or 2 pm (the special TWC sounding at 18Z indicated that the atmosphere had stabilized and there was no CAPE in that sounding). Northwesterly winds prevail this morning but the morning soundings at Phoenix and Tucson have some residual CAPE – drying will restrict any storm activity to the eastern mountains and southeast borderlands. Expect that this dry-out period will continue into early next week. Other miscellaneous – out in the Pacific, Guillermo has become a hurricane and is moving off toward the west. The NAM forecasts a substantial inverted trough will be moving westward across Mexico next Monda, and we’ll keep an eye on that. In the longer term, the GFS forecasts a significant hurricane in the Gulf of Mexico (see 10-day SLP forecast above). The model has been very consistent in predicting an Atlantic hurricane; however landfall has ranged from around New York to New Orleans. Also to note, preliminary reports of a microburst occurred at Luke Air Base with wind gusts of 69 kts recorded at 22:22 to 22:26 in the Mesowest network. What a pleasant change – cool, light showers, and heavy clouds (see 7:20 am KEMX radar chart). The subtropical system from Mexico did arrive a bit more quickly than the models indicated and easterly winds in mid-levels increased substantially during the afternoon. Thunderstorms developed on the mountains and moved into Tucson around 5:30 pm with gusts to near 50 mph and blowing dust. CAPE was apparently limited and neither TUS nor DMA carried a thunderstorm. A cell over the west flanks of the Catalinas developed after the first push and produced two rumbles of thunder here at house. I saw one CG strike to the north in the foothills. I should have paid more attention to my admonition on Tuesday that events such as this often develop more quickly than the models indicate. Almost all observing stations in a large area of southeast and south-central Arizona had measurable rainfall, although amounts were generally light. In the ALERT network in Pima County only 8 stations did not measure rain. Five of the stations had 0.50” or more and Arivaca measured 0.94” – most amounts were around a quarter of an inch. The same is generally true for the Phoenix metro area ALERT network also (with the storms and rains arriving during the night and early morning hours this is the first significant rain event of the summer up there) with almost all stations having rainfall except for a few on the eastern edge. The rain amounts appear to have been heavier in the Phoenix network. Luke AFB had thunderstorms, gusts to 69 mph, and also the most rain reported at 1.00”. There is substantial CAPE present in the TWC sounding this morning but obviously heating will be limited. A strong outflow from the mountains would likely produce spectacular storms with winds and R+ given the sounding – we’ll have to watch to see how the details evolve. There does appear to be instability for parcels lifted from elevated layers, so the forcing with the subtropical low, coupled with that of the mountains, should keep showers going off and on through evening. The low is being picked up by an upper S/W coming across the Southwest before the larger trough to the northwest affects us, drying things out again for several days. Abbreviated message – I have to get into Atmo for the daily discussion. The cloud cover certainly won out yesterday. Slightly cooler temps, higher pressures and a retreat of the moisture back into Mexico dominated our weather. 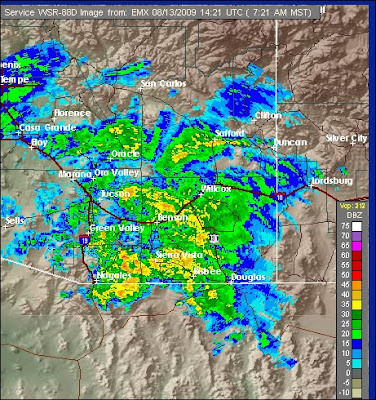 Radar precipitation estimates show that all of southeast Arizona was quite suppressed yesterday. There was no rainfall recorded in the ALERT network. The only uptick was a brief increase in moisture and the stubborn cloudiness. I’ve posted several data plots on the blog that illustrate the dismal precipitation that’s occurred during the summer so far across the state. 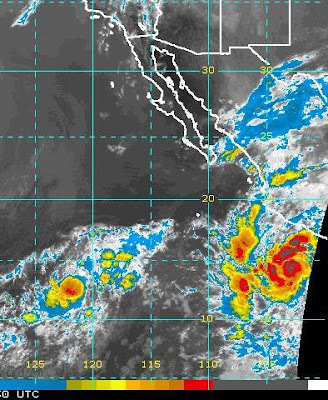 As for today – MCSs have formed and dissipated through several cycles in Mexico during the night, while propagating northward (see 1330Z IR image). The satellite imagery this morning shows a large cloud mass covering most of western Mexico that is moving northward. The soundings this morning at Phoenix and Tucson have slight to no CAPE and thus the issue of whether cloud cover hangs around or not today is probably not of great importance. The nocturnal activity in Mexico appears associated with a distinct inverted trough at 500 and 700 mb. The NAM model continues to forecast an important precipitation event across much of Arizona as it forecasts this feature to move northward, split the anticyclone apart, merge with a weak upper S/W in the westerlies and then move eastward. Thus, the model forecasts an interesting interaction of features from the subtropics and westerlies, all accompanied by a large push of moisture and precipitation northward into the U.S. It appears that this transition has begun and that it will affect southern Arizona beginning late afternoon or tonight and then continue into Friday, bringing the subtropical air mass finally back into Arizona. Finally - How Have The Last Two Weeks Gone? It appears that the only way we can go is up! This slide shows how the entire summer rainfall total (June 1st through September 30) for the watersheds ended up relative to the rainfall in early summer (this chart also from Jon Skindlov). Note that only one year (2008) of the past ten that was normal or dry during early summer recovered in August and September to end up as a wet summer. I thought that I'd add a bit of information to the blog posts illustrating how the summer has gone so far around the state. The above slide (thanks to Jon Skindlov) shows watershed averaged precipitation of the combined Verde and Salt watersheds. The period covered runs from June 1, 2009 through August 9, 2009. 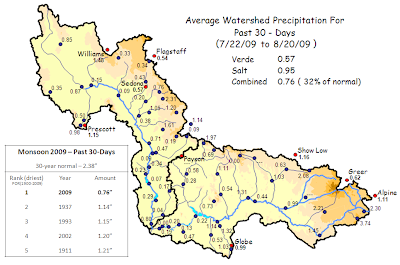 It has been a dry July in these watersheds with rainfall accumulation through the 9th standing at 62% of average. Yesterday storms occurred to south and southeast and also briefly on the Catalina and Rincon Mountains. A large MCS developed (see 03Z IR image above) with most of the active cells staying south along the borderlands (Nogales had thunder, rain, and gusts to 46 mph), but outflows spread north through most of southeast Arizona bumping the dewpoints back up. Heavy clouds covered the sky this morning – remnants from last night’s MCS. Measurable rain occurred in the past 24-hours at 6 of the 93 Pima County ALERT gauges, with Manning Camp high in the Rincons measuring 0.67”. So two issues for today will be: 1) how quickly will the cloud cover break up to allow heating? 2) will low-level moisture continue to slowly increase? Note that with precipitable water up to around 40mm in the PHX and TWC soundings we have had a nice increase, but the really moist subtropical air has not quite moved into Arizona. The soundings indicate that we will probably still have quite limited CAPE at low elevations this afternoon. South winds at Guaymas extend up to 700 mb, so there are good signs that things will continue to improve today and tomorrow. The western circulation center of the massive, mid-level anticyclone that covers the southern half of US and much of the subtropics has consolidated along the New Mexico/Arizona border. This provides a nice wind profile for moving mountain storms toward the deserts. The NAM forecasts that the subtropical moisture will push north and interact with a weak N-S trough embedded within the anticyclone – the result is that the model forecasts the most active days to occur on Thursday and Friday. Since the model is often slow, tomorrow might be the day that we see much increased activity, after another uptick today. Low-level moisture has slowly increased over southeast Arizona (see plot of GPS PW trend at TWC) since mid-day yesterday, essentially south of line from Douglas to Oro Valley to Sells and out through Why. Morning dewpoints today are 10 to 20F higher than yesterday morning and surface pressures are up 2 to 3 mb – so some good and some bad in the obs. There has been weak southerly to easterly flow aided by outflows from storms along and south of the border. There does appear to be a weak surge signal in low-levels of the Guaymas sounding this morning. But overall it’s a pretty chopped up synoptic pattern, with mostly westerly flow over the southwest U.S. at 500 mb. Definitely more CAPE along the borderlands today. If Tucson were to mix out to 8 or 9 g/kg this evening there would be a silver of CAPE here at lower elevations. The NAM indicates that today will be a day of adjustment at 500 mb with the small anticyclone center that’s over northwest Sonora this morning trying to consolidate over New Mexico. The main center remains over the far southeast U.S. A weak inverted trough extends from southern end of Gulf of California to the bootheel of New Mexico. The NAM continues to strengthen this trough some and move it slowly up into southeast Arizona. If this indeed occurs, it will help push moisture and outflows northward and that could lead to considerably more storm activity this evening and especially tomorrow. The NAM appears to have a convective feedback effect going between noon and midnight in the area between Nogales and Green Valley, where the model forecasts a rain bulls-eye of around 3 inches. So, we should keep careful watch to the south today to observe whether the model has latched onto something other than an internal convective runaway. The NAM forecasts a substantial increase in moisture and precipitation on Wednesday and Thursday, as it apparently shifts the subtropical air northward for a couple of days. So, it looks like a week of much increased possibilities for rainfall than what we’ve experienced in past several days. In the longer term, the ECMWF is again very aggressive with the next Pacific trough and brings it inland across all of the west, putting the Fall-like pattern back into play. It was a crisp and very sparkling morning here at the house. I didn’t check the thermometer until 6:30 am and it was then at 64F – may have been lower. I see some stations away from the city were in the 50s. Unfortunately, we now have had 3 more consecutive days with no rainfall across the Pima County ALERT network. Not much more to say about current conditions. Precipitable water amounts are less than half an inch across the state except for the far southeast where amounts are hanging in there at three quarters of an inch. The morning upper-air charts show a large, inverted trough in the easterlies (present from 200 mb down to 700 mb that arcs from Arkansas to the region near and south of the southern end of the Gulf of California). This feature is butting heads with the unusually deep trough in the westerlies that is affecting all of the US west of 100W. Looks like the inverted trough in easterlies will shear apart – with a portion in lower troposphere moving out into the Pacific (see below re model TS development) and the portion from Texas to Arkansas pulling away to the northeast – leaving a weak trough over Mexico. There is 700 mb cool advection into the lower Gulf of California which will keep pressures relatively high down there, perhaps pushing more moist low-level air toward southern Arizona. The NAM forecasts this morning indicate several interesting developments by Tuesday and Wednesday. The model spins-up a new Tropical Storm southwest of Baja. It also appears to consolidate the remnant inverted trough over central Mexico and swings that strengthened feature northwestward across western Mexico and into Arizona by Wednesday afternoon. While this is happening, the model shifts the western center of the subtropical anticyclone northward toward the Four Corners region. If the events depicted in the model forecast actually transpire, we would see a significant low-level surge of GoC moisture into southern Arizona as early as Tuesday morning leading to a return of thunderstorm activity. So, there are some things that we should keep an eye on as the new week gets underway. Shown above are the GPS precipitable water estimates for the TWC (Tucson) sounding site for the past five days. Note that there is a slight dry bias for the morning soundings during this period, but the afternoon RRS sonde data dry bias is very large. My contention is that these are unacceptably inaccurate data for use in short-term forecasting (often the most critical public forecasts that the NWS makes). On the evenings of August 4, and again on the 5th (00Z on the 5th and 6th), strong storms were approaching the Tucson metro area from higher terrain. The observed and transmitted soundings for TWC have absolutely no CAPE available for storms. This is because of the extreme dryness indicated by the RRS sondes in the deep boundary layers. The sounding on the 6th appears to have "missed" 5/10s to 6/10s of an inch of the actual precipitable water present. My second contention is that there is no way that a forecaster can quickly guess what the actual sounding structure might be - this is of course a game with infinite solutions. Strong storms, gusty winds and restricted visibilities due to blowing dust occurred on both evenings. Who knows how some future researcher might interpret the archived, official, RRS upper-air data with the observed weather? The bad data, of all types, in the RRS soundings constitute a serious problem that no one in NWS management seems to want to talk about, much less formally warn the external user community. Personal note - I'll be out of town witout computer access tomorrow. Very suppressed yesterday except for far east. Hot dry winds yesterday and again for today. The bit of rain that fell Tuesday and Wednesday is now blowing in the wind toward Kansas. Satellite image for 1500Z shows skies mostly clear across all of Arizona. Dewpoints are mostly upper 20s and 30s with some 40s in far southeast.The western trough and 90 to 100+ kt upper-jet across Arizona makes the pattern appear as if Fall is here. So, the question for now is how long the dry weather will continue. Or I could say that the failed monsoon had a two day break with some storm activity in the southeast, but that it (the failed monsoon) came back quickly. There are two very large inverted troughs off to the east- one stretches across the Gulf of Mexico and the other is out in the west Atlantic. The GoM feature extends down to 700 mb and will push west and do battle with the western trough in the westerlies. Forecasts indicate this feature will shear apart with the lower portion weakening and coming across central Mexico. Looks like that's about the main thing we have to watch the next several days. Summer 2009 - so it goes. The small S/W at 500 mb that was the focus of yesterday’s activity moved north further east than the NAM predicted and is over southwestern New Mexico this morning. The northward movement of this feature – combined with the onshore movement of the California cutoff – has realigned features at 500 mb. This morning there is one anticyclone center over the southern GoC and one over the eastern Colorado/New Mexico border. 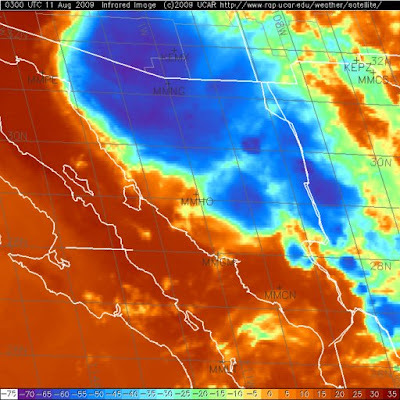 Arizona is now within the southwesterly flow regime around the cutoff low. Dry low-level air is present over western Arizona; however clouds and light showers linger from Nogales into the Phoenix area. The upper-air charts and VAD winds indicate that drier air should spread eastward today and limit storm activity to the higher elevations of the state, basically east of Tucson to Flagstaff line. Both the Tucson and Phoenix soundings were modified by the cloud deck overhead. The Tucson sounding also had several superadiabatic layers that produced a false cooling in the layer from 520 mb to 450 mb. The NAM forecast indicates that storm activity shuts down through the weekend, with anticyclone in southwest again pushed into northern Mexico, and the main lobe of 500 mb high pushed far to the east. A very large inverted trough (one of the few we’ve seen north of 20N this summer) is forecast to be moving westward across central Mexico over the weekend (see above 84-h NAM forecast), while the tail of the west coast trough is sheared off and left behind off the coast of southern California and northern Mexico. So, it appears that the larger-scale situation will again become very complicated as we start next week. Finally, Tropical Storm Felicia was named by the NHC two days ago and was forecast to remain a TS – but this morning she is a Category 4 hurricane. Too far away to be of interest to us, but folks in Hawaii are probably keeping a close eye on her. 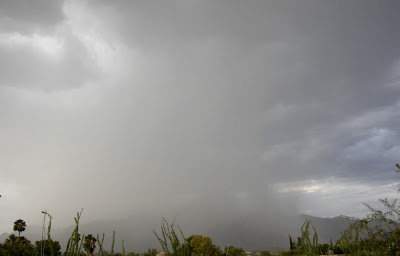 Image shows storm and downburst on west flanks of Catalina Mountains at 6:30 pm MST yesterday afternoon. There were quite a few storms over the metro Tucson area and this one back-built to south merging with other cells. Three distinct rain periods at house produced 0.50" of rain - the most rain in a day at house since the 4th of July. There was measured rainfall at 43 of the 93 gauges in the ALERT network. There were six gauges that recorded 0.50" or more and the max amount was 0.91" - not bad for such a hot and dry boundary layer. The airport observing station recorded dust, a gust to 44 mph but only a Trace of rain. Nogales had winds to 35 mph; Davis Monthan AFB had gusts to 33 mph; and the rooftop anemometer at Atmo hit 60 mph. Here in the north part of town the lightning was was quite wicked during the onset of the storms. Unfortunately, the Nonsoon continues up in Phoenix region. There apparently wasn’t enough rain from yesterday’s high-based storms to support much recycling, and the morning soundings remain quite dry below 600 mb. There will likely be CAPE available at low elevations this evening, but the TWC soundings have been so bad this week that there’s little help available from them. Last night’s sounding provided no help at all for making a short-term forecast as thunderstorms approached from the east (see radar image on blog). The sounding was apparently about a HALF AN INCH too dry wrt PW! One could make guesses with an interactive routine to try to “fix” the sounding but those are still guesses. One of the stronger storms propagated toward the south and hit the radar site in the Empire Mountains, knocking the radar offline for much of the evening. I note that the Phoenix sounding this morning has increased PW at 42.1 mm, which is a good sign for this afternoon. There have been problems with the GPS PW network, so there is little info available for cross-evaluation. Another dilemma this morning relates to the NAM analyses and then its forecasts for this evening. The 500 mb anticyclone is quite strong now and centered over northern New Mexico. The NAM analyses indicats a weak S/W southwest of El Paso – satellite loops indicate a feature in this area moving toward the west-northwest. (The 700 mb plot indicates that a weak inverted trough extends north from the southern end of the GoC into western New Mexico, further indicating that there’s a feature where the model thinks it is.) The NAM forecasts this feature to intensify during the day and move into southeastern Arizona this evening. The NAM forecasts an excellent setting for severe storms this evening and it would likely be a very significant storm day if there were a more moist and unstable boundary layer present. As it is though, there will likely be a bit more CAPE today and there should be an increase in storms with more winds and dust and nice lightning displays. My outlook for here at the house is that today is the best day since July 22nd and that measurable rain chances are about 50%.